A whistleblower who went on the run after publishing a dossier on 30 alleged safety and security concerns about Britain’s nuclear deterrent has handed himself in to police upon his return to Britain. 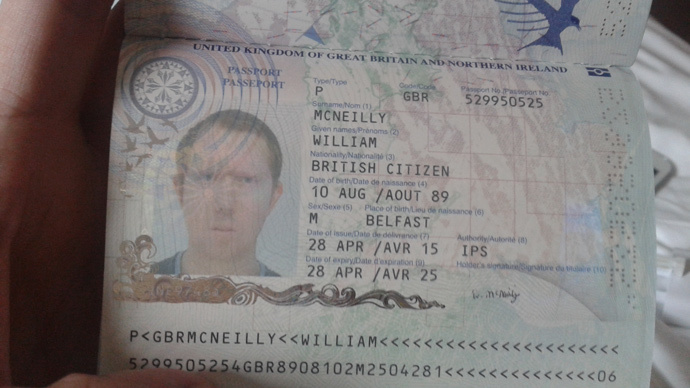 William McNeilly, 25, is now being held at a secure military base in Scotland, according to authorities. He is believed to have been apprehended by UK authorities at Edinburgh airport on Monday evening. A Royal Navy spokeswoman told RT McNeilly was stopped on Monday night at Edinburgh airport, and is now being detained by Royal Navy police at a military base in Scotland. She said the young submariner is being “afforded the duty of care” the Royal Navy offers to all of its staff. She said the body would continue to investigate the issue comprehensively. The whistleblower’s brother, Aaron McNeilly, said on Facebook on Tuesday morning he felt “happy” his sibling was “safe and well.” He later added his brother was in Scotland, after handing himself in. In a lengthy Facebook statement on Monday afternoon,McNeillyannounced that he was ready to turn himself him after days on the run. “Anyone that thinks its better to invest £100bn in times like these on nuclear weapons over than over the future of children in this country is pure madness in this age,” he added. He also claimed in the statement to have moved between countries and locations on a daily basis using multiple aliases.